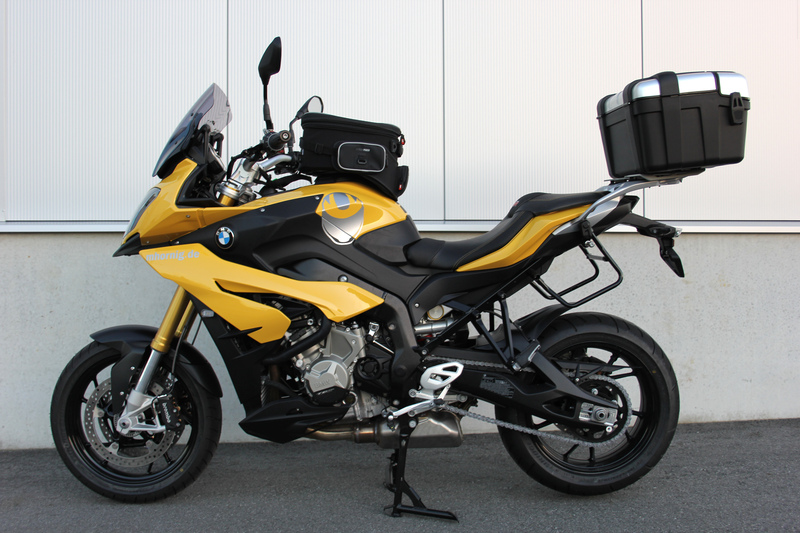 In 2015 the S1000XR was launched by BMW Motorrad - a motorcycle that combines the dynamics of a sports bike and the universalism of an adventure bike. It unites the power of the S1000R and the comfortable sitting position of the GS models and thus represents a novelty in the product assortment of BMW Motorrad. When working on our S1000XR conversion, we devoted much attention to making the sporty motorcycle even more comfortable for longer tours. 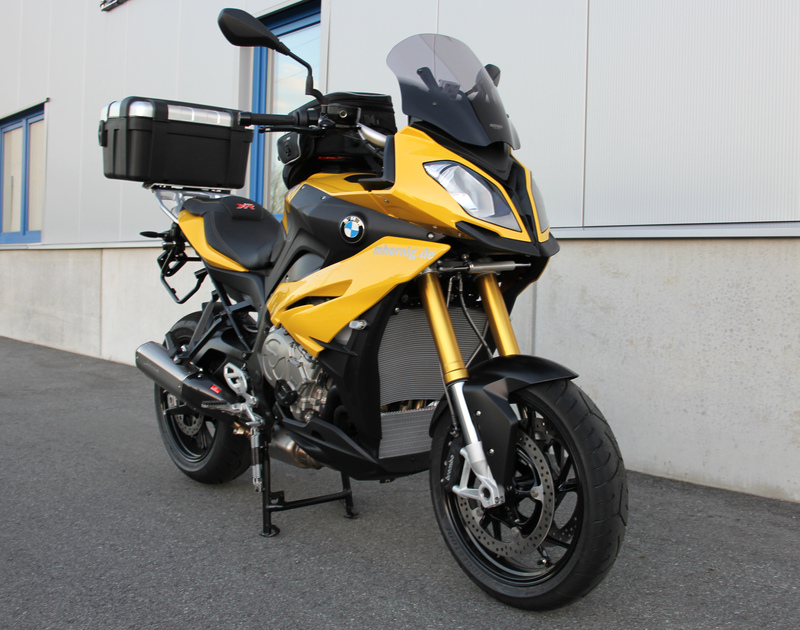 Moreover, we attached much importance to details that augment the security of both the rider and the bike and to an individualized appearance of the S1000XR. At first, we replaced the original windshield by a smoke grey touring screen, which has the same form as the original screen, but is inclined upwards on the top, so that the airstream is better deflected over the rider. The original seat was subject to a seat modification. Hence, the sitting comfort was significantly improved. In addition, we installed our handlebar risers (25mm) which permit a more upright position of the driver and therefore also increase the sitting comfort. An optimal handling of the bike is permitted by our Synto brake and clutch levers because they can be individually adjusted and adapted to the hands of the driver. An easy accessibility of the levers is indispensable in order to be able to enjoy a comfortable driving experience when on tour. A good view to the navigation system is also an important factor on journeys wherefore we installed our GPS mounting. Another essential thing on longer trips is enough storage space. 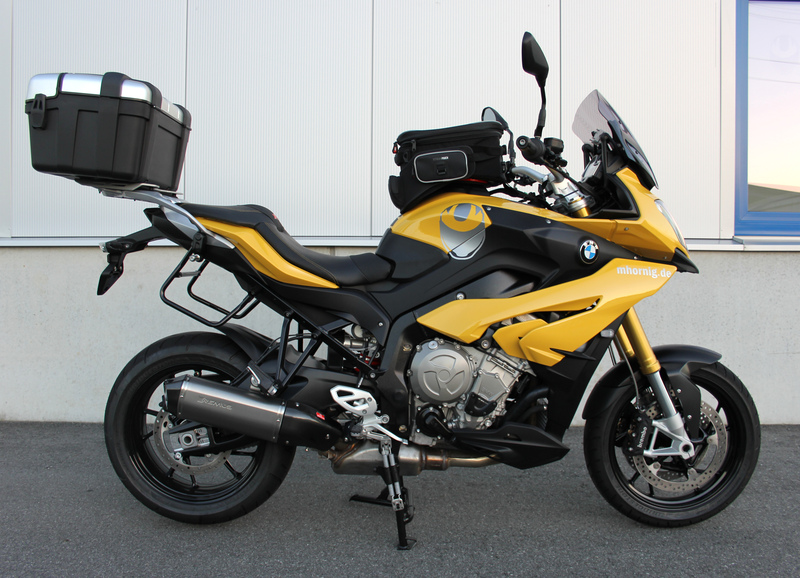 Therefore we equipped our S1000XR with the GIVI Trekker case which has a capacity of 46 litres and is mounted onto the model-specific top case mounting made of aluminium. 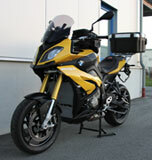 Moreover, we provided our S1000XR with a GIVI tankbag (capacity: 20 litres). In order to prevent a theft of the oil filler plug we replaced the original one by our oil filler plug which is made of anodized aluminium and can only be opened by means of a torx T45. Our side stand foot enlargement permits a secure stand of the motorcycle on all terrains and our engine crash protectors protect the engine of the S1000XR ideally from accidental damages. The installation of our mirror extensions makes it possible for the driver to have an unlimited view to the following traffic - an important factor of security in road traffic! We also mounted our Magnum horn Wolo which, thanks to its 139 decibels, reduces the risk of being overlooked and thus contributes essentially to the rider’s safety. 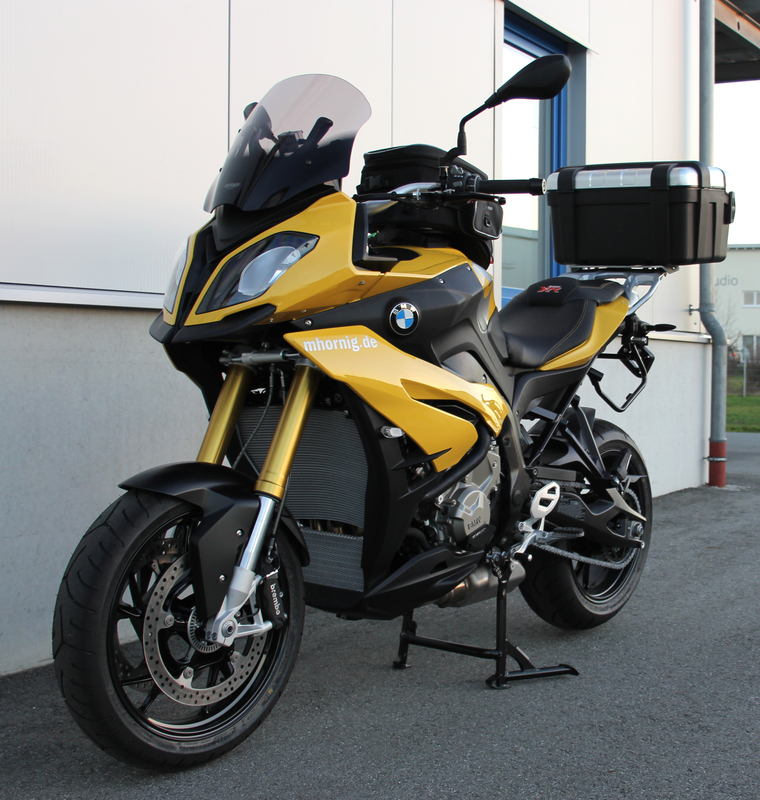 For the fancy visual design of our S1000XR we have installed our cooler screen which in addition protects the oil cooler against dirt, insects and stones. The carbon fiber tank pad creates a new visual highlight on our conversion and simultaneously prevents scratches on the tank. Our LED fairing turning signals give a more elegant look to the S1000XR and our swing arm pivot covers as well as our centre cap top yoke contribute to the individualized appearance of the motorcycle. 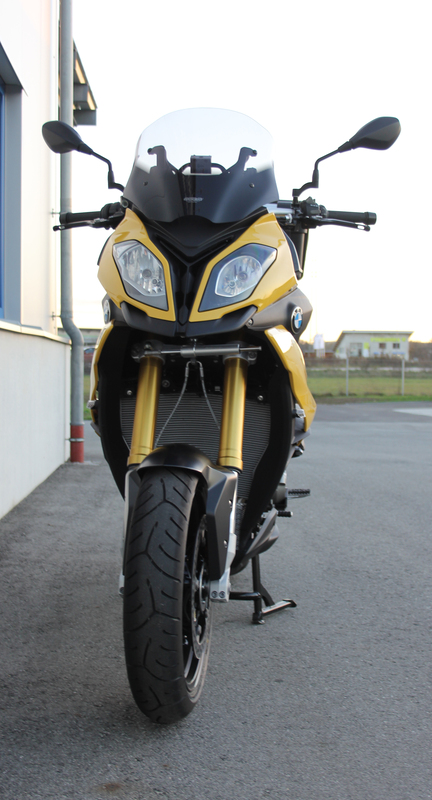 The bright yellow varnishing of all fairing parts of our S1000XR and the matching yellow seams of the seat constitute other remarkable details that bring the individual appearance of the bike to perfection. 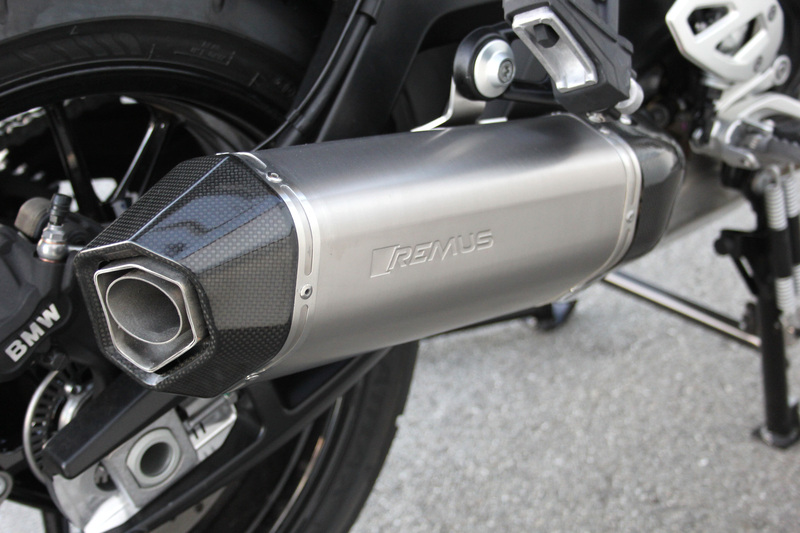 Our conversion is completed by a Remus HexaCone made of titanium, which gives a noble look to the motorcycle and by the way also offers a great sound and an optimal performance.